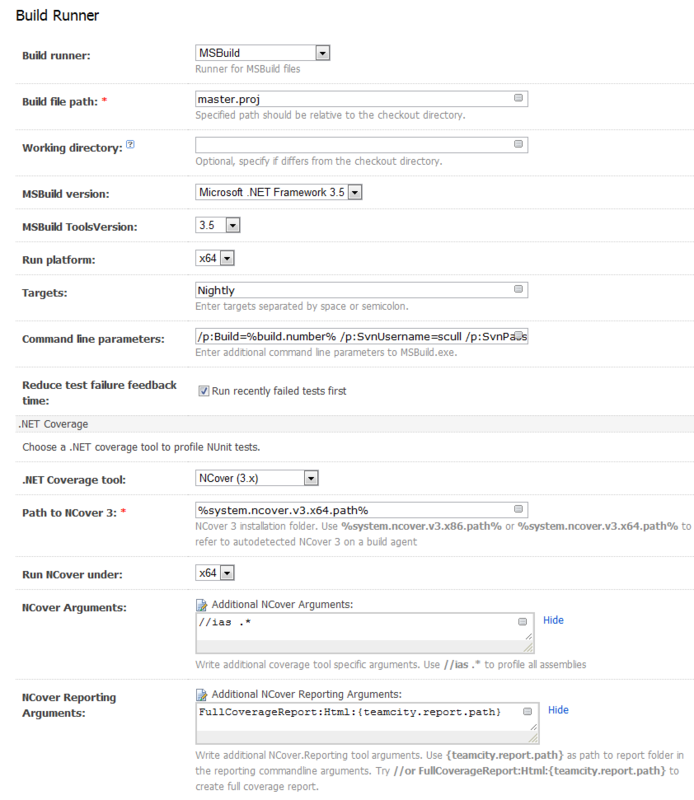 Do I need any NCover arguments configured? Do I need any artifact paths setup? index.html file is generated if there was not index.html file generated by the NCover3 report generator. and //ias . * for NCover Arguments. I get this same issue!! I have set these properties as you have suggested but I still get the auto generated index.html file. I have attached my log file and a screen shot of my configuration UI. Help with this would be appreciated. Does generated index.html file contains links to NCover generated report? Please have a look the previous my commend with an explanation of the generation of index.html by TeamCity. What would you expect to see instead? The generated index file contains nothing other than the the html for the subject line (I have attached the coverage.zip atrifact file the teamcity creates). What I would expect to see is the Html coverage reports that I would get when I run ncover directly. When I click on the 'View full report' link or the 'Code Covergae Tab' I see the 'This is an autogenerated index file (there was no index.html found in the generated report) with NCover 3' message when I expected to see the full report html or the SymbolModule report. You have missed //or in the coverage reporter parameters. You may start NCover.Reporter.Console.exe /? to find more information on reporting arguments. I think the 'or' part threw me off as I stupidly assumed it was 'this or that' rather than the whole line being the command line switch.